El Salvador culture is a mixture of cultures Mayan, Lenca, Nahuat, Ulua, Spanish and other ethnic minority groups. Less than 1% of the population speaks Nahuat. The Catholic religion played an important role in the culture of El Salvador. Painting, ceramics and textile articles are main manual artistic expressions. Writers Francisco Gavidia (1863-1955), Alberto Masferrer, Salvador Salazar Arru�, Claudia Lars, Alfredo Espino, Pedro Geoffroy Rivas, Manlio Argueta and poet Roque Dalton are among the most important artists coming from El Salvador. 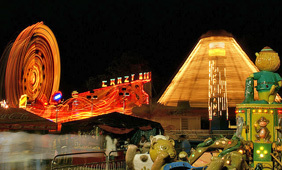 The Agostinas festivals are held in honor of the divine world Salvador in the capital city of El Salvador. Major events are carried out on 5 August when it is organized a procession with the image of Jesus Christ that part of the Basilica of the sacred heart of Jesus and ends at the Cathedral. 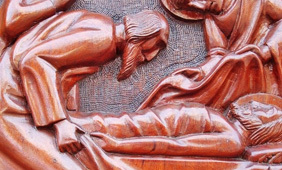 This site performs a simulation of the Transfiguration. Furthermore, on 6 August is celebrated a solemn Eucharist. Apart from the religious calendar, there are other events such as the election of the Queen of the fiestas, the parade of the mail (which announces the start of celebrations and takes place August 1); the parade of trade, park attractions, and other popular celebrations organized by the Mayor of the city and others. The main week revives the passion and death of our Lord Jesus Christ to the miracle of the resurrection of the nature of the mustios and cold winter months. Today the celebration of Holy week, on joining the holidays are the most important events in the life of people, cities and the capital. They are also the most beautiful events in Nations-speaking Hispanic, especially Spain, which are of a colorful, beauty and religiosity is not duplicated anywhere else in the world. The procession, carrying on a journey to the patron saint of a place, the images of the Virgin and Jesus Christ, culminate the solemnities. A pupusa (of pipil pupusawa) is a thick corn tortilla handmade that is filled with one or more of the following ingredients: chicharr�n, refried beans, cheese, cheese with flour. Also this revolt pupusa with mixed, like cheese, bacon, beans, chicharr�n ingredients. 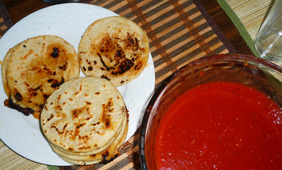 The pupusas are the most widespread El Salvador typical food. The preparation of that foodstuff involves several steps and use of various ingredients, which also constitute an economic contribution to the producers. The El Salvador State bodies have repeatedly expressed the pupusas are part of the culture of El Salvador; Therefore, on 1 April 2005, airs the Legislative Decree No. 655. 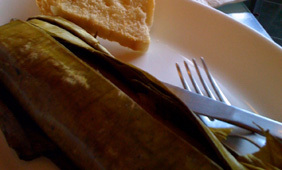 Apart from the traditional pork or chicken tamales, there are also other varieties, always from maize, among them: of chipil�n, where the mass join leaves of the plant; Both classes used as packaging of bananas or banana leaves and lack a fill. In addition, also consume corn, whose main ingredient are ground and mixed with milk or butter tender corn tamales, also exist tamales fried beans, cheese or chicharr�n, and are wrapped in the same elotes leaves. Finally in El Salvador to sweet tamales are known as "sugar" and fill is usually based on grapes or prunes or jams from pineapple. This type of tamales is also becoming more scarce. El Salvador there are different types of costumes, in which most are used in different festivals, although there are some people who still use them. 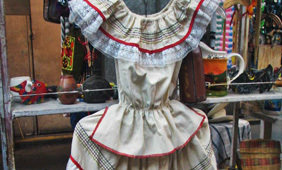 In the women's costume is common to see items such as a scapular, a shawl, a cloth and different colors and fabric ornaments of cotton and can be with a skirt and a blouse or a dress, shoes sandals are used. In the men's costume is common to see a costume cotton, also in the traditional festivals, modern jeans with a shirt of blanket, used in footwear shoes or boots, and a hat. Really are rural in nature and presented different variations depending on the place.